You’ve decided it’s time to hire a professional painter for your painting project and you’re eager to get started. Before he begins the job, it’s important to do a little homework on the best hues to choose. Truly, the colors you, your painter and (if applicable) your interior designer pick will have a dramatic effect upon the look and feel of your home’s exterior or interior. After all, you’ve most likely been in a residence or workplace where the colors on the walls, ceilings and woodwork are glaringly unsuitable. That’s a good reason to be very deliberate. To get started, consider the following three elements of your job. 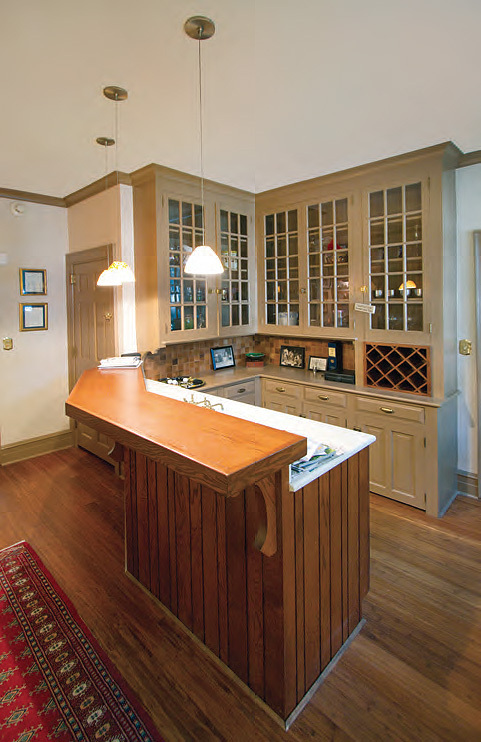 All were taken to heart by one of my clients, Jennifer, whose Lancaster home illustrates this article. To give some background, Jennifer’s residence was very out of date with old wallpaper and damaged plaster walls. I can relate because l also live in an older Federal-style home which too has been meticulously restored. We were referred to Jennifer by an industry leader in fine home sales for our expertise and knowledge in these types of homes. I jokingly referred to this project as the “much” bigger brother of the home I live in. We are also familiar with the difficulties of working with older paint finishes, challenging wall textures and more, all of which were part of Jennifer’s house. While Jennifer collaborated with her designer on color schemes, our main focus was to see that the prep work (no small task given the home’s condition) was performed meticulously. In so doing, we could ensure a professional finish that would look absolutely beautiful upon completion…and would stay that way for years to come. What colors will go well with your home’s architectural design? 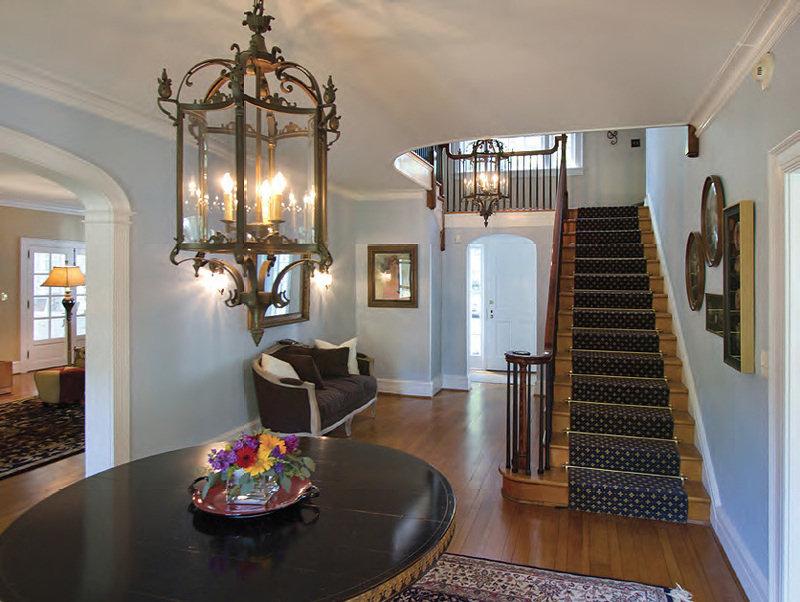 A Victorian mansion begs for a different color palette than does a contemporary chateau. That’s why picking a color scheme to fit your location’s architecture makes sense. If you’re a bit overwhelmed by the prospect, never fear. There are many websites devoted to this subject, and experienced painters and interior decorators/designers can assist you. 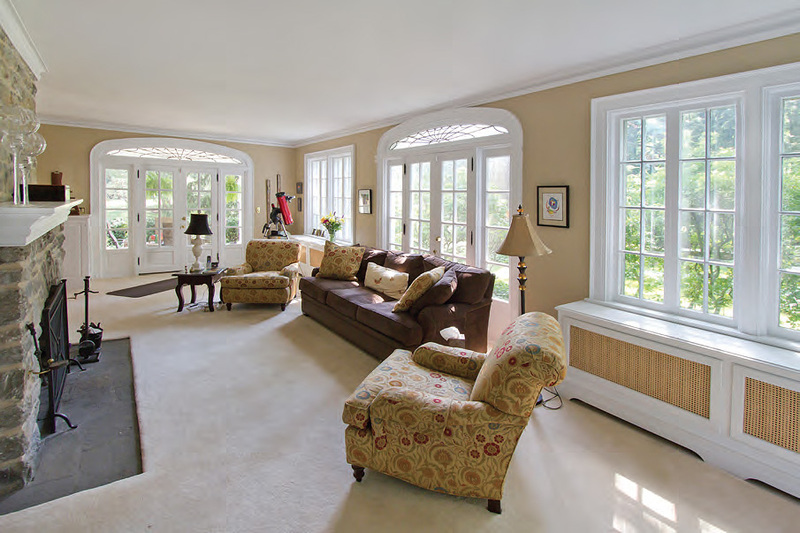 Jennifer and her husband conducted their own research, first determining that their 7300 square foot home was closest to a federal style and then uncovering the colors that represented that period. Subsequently, they were able to bring their findings to my team. The results were excellent; because they had done their “due diligence”, the house’s architectural design was highlighted magnificently. What colors will emphasize the “little things”? Jennifer’s house had some seriously elaborate carvings and moldings, so it was essential that the shades used drew the right amount of attention to restore them to their former glory. In some cases, a complementary color can be used for an intense effect; in other cases, it’s best to go with a subtle end product by using a color a shade darker or lighter than the surrounding tints. carvings in the ceiling. The colors had to show off the wonderful features of the residence without being ostentatious. Another issue in this instance was the fact that the plaster walls were old and unusually textured. That meant the color had to penetrate every “nook and cranny” in a very natural way. As the photos show, the result is a seamless integration of color that lends itself to a calming ambiance. What colors will you want to look at day-in/day-out? Unless you’re painting someone else’s property, you’re going to see the colors chosen regularly. Many studies have been conducted on the innate psychological properties of color. Reds emphasize energy, whites connote purity, blues promote calm…the list goes on and on. 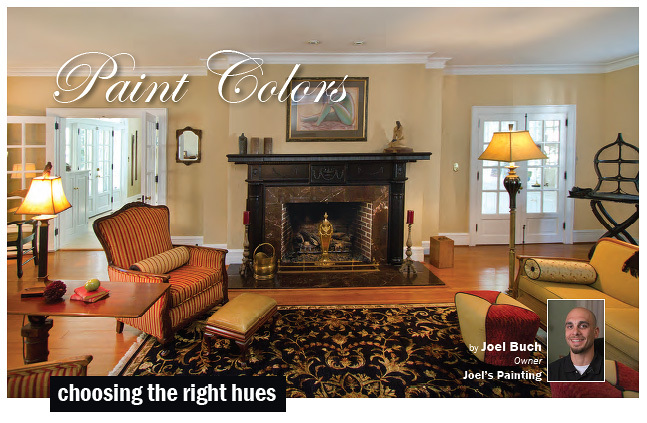 In the end, as the homeowner, you have to be able to live with the hues on your walls. Now, this isn’t to say that if you adore green, you should paint the house green! In fact, I would say it’s best not to let your “favorite” color dominate the other considerations of your project. Yet there’s nothing wrong with adding a little of “you”, even if that simply means picking a harmonizing shade for door and window moldings. Remember to always take heart and approach a “stitch in time saves nine” attitude. Jennifer did and loves the results. “We’re just so happy here,” she explains. “It’s open and amazing! 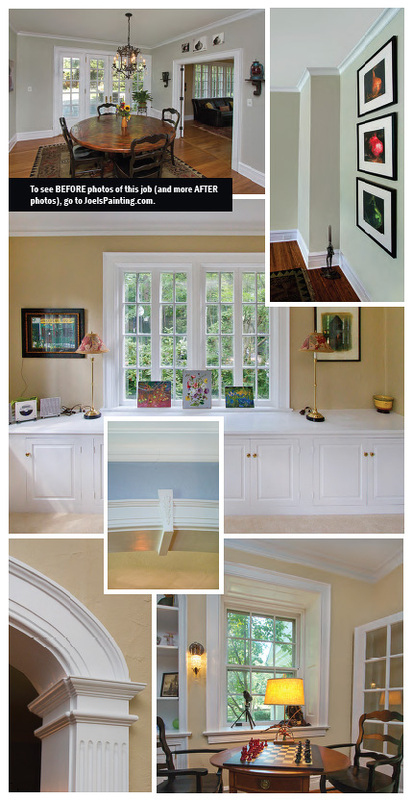 Joel’s Painting did a great job and we’re just so pleased with everything!” Want to be wowed by your next painting project? When quality matters, call us at 471-4273 or visit us online at JoelsPainting.com.